Accessible parking. Spacious rooms. Comfortable beds. Friendly service. Situated a 2-minute walk from the centre of Lednice and Lednice Castle, this hotel features an outdoor swimming pool and jacuzzi. 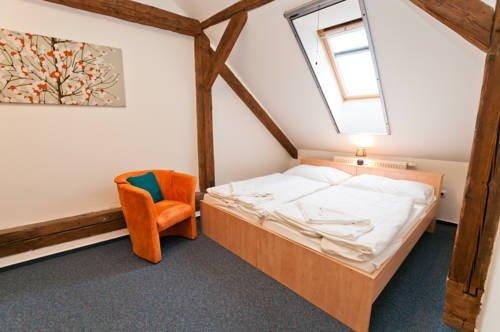 Free camera-surveilled parking and a children's playground are available.The rooms a Relax Hotel Stork are equipped with free Wi-Fi, high-quality medical mattresses and a TV. The private bathrooms feature hairdryers.Wine tastings are held in the vaulted cellar of the Relax Hotel.Guests can visit Lednice Castle and go sailing in the castle's park or go cycling or horseback riding in the countryside of Southern Moravia. In the wintertime, it is also possible to enjoy ice skating on the Dyje River in the park. Great location. Very good location. Good location. Tasty breakfast. Rich breakfast. Great breakfast. Separate kitchen. New furniture. Cozy room. They have a swimming pool. Water quality is weird, it is very slippery.